Sophomore first baseman Rachel Hooper hits a walk-off single into center field. The softball team picked up a critical win on Friday, beating Diablo Valley College on a walk-off single by sophomore first baseman Raechel Hooper. It was the team’s second win of the day and improved their record to 24-6 on the season. 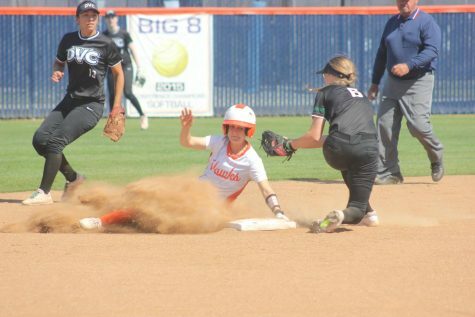 After shutting out the Vikings in the first game of the double header with a 7-0 win, Cosumnes River pulled out a late-inning comeback and won 5-4 in the second game. “Every win from here on out is important. The (Big 8) conference is just tough, every game you have to play. 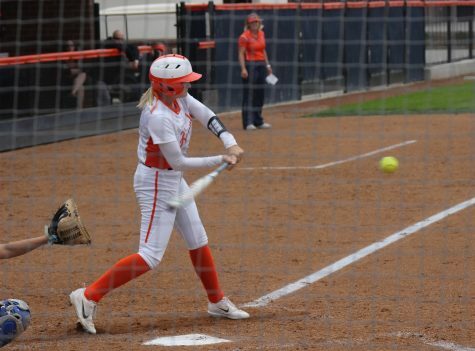 We almost run-ruled them the first game and then they came back and gave us a run for our money in the second game,” said head coach Kristy Schroeder. With the win, the team improved its conference record to 8-3 and moved into second place in the Big 8 Conference, trailing Sacramento City College (8-1, 20-5-1 overall). CRC’s bats got the team out to an early lead, providing run support for freshman pitcher Angelica Dark. Freshman pitcher Aimee Hutchinson put the team on the board first with an RBI double to score freshman outfielder Amber Wright. Freshman first baseman Lindsay Lambert followed up with an RBI single to right field, scoring sophomore second baseman Kaitlin Pires to give the Hawks a 2-0 lead. Dark was able to keep the Vikings scoreless, but ran into trouble in the fourth inning. Dark allowed a two-run single to tie things up in the fourth. Hutchinson, who a complete game shutout in the first game, came in to replace Dark and quickly recorded a strikeout to end the top of the inning. After a scoreless bottom of the fourth for CRC, the Vikings jumped out to a 4-2 lead in the fifth. The Hawks two-run deficit didn’t last for long. 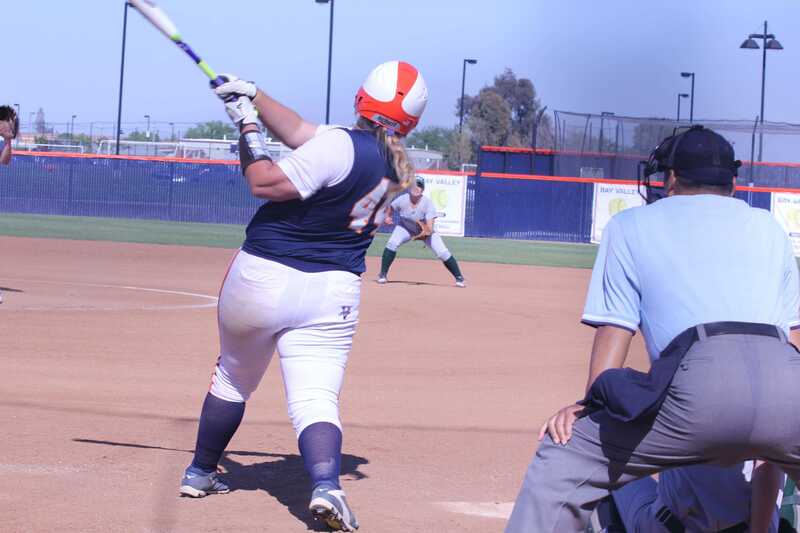 In the bottom of the sixth, Lambert lined an RBI double to freshman outfielder Alexus Acosta to give Diablo Valley a 4-3 advantage heading into the seventh inning. 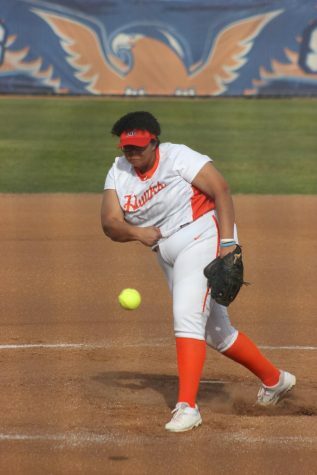 Hutchinson quieted the Vikings’ hitters in the top of the seventh, retiring the side in order and finishing the game with three ⅓ innings pitched and improving her line on the day to 10 ⅓ innings, allowing just eight hits, two walks and two runs allowed (one earned). 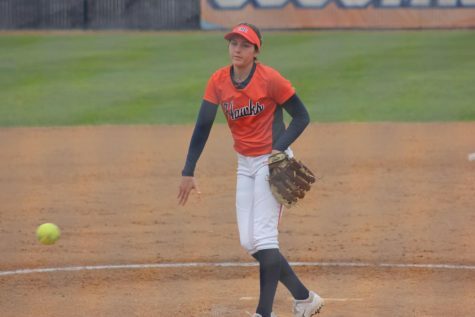 In the bottom of the seventh, CRC caught an early break thanks to a throwing error that allowed sophomore shortstop Brenda Velasquez to reach second to start the inning. 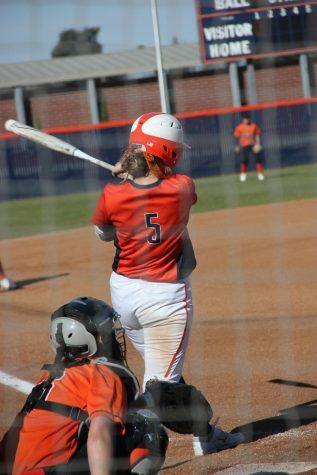 After a groundout advanced her to third, she came around to score the game-tying run when the Vikings’ third baseman bobbled a ground ball and resulted in no throw. Pires lined a single into center field to put runners on first and second with one out. Then Hutchinson drew a walk to load the bases. After starting the game 0-3 at the plate, Hooper drilled a walk-off RBI single to win the game. “Hooper made an adjustment at the plate. 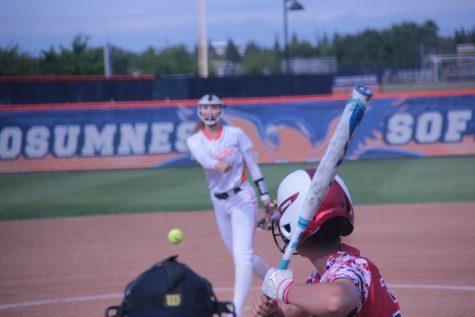 She struggled early in this game and looked really bad but then had two laser shots and obviously the game-winning hit at the end,” Schroeder said. 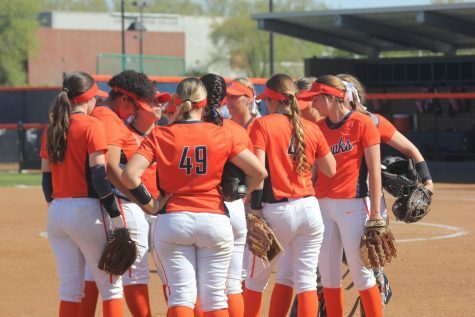 It was another comeback win for the softball team and marked their third walk-off victory of the season. They will continue conference play on Tuesday at Santa Rosa College, followed by a double header against Modesto Junior College on Saturday. “When our team believes they can do it, we play great,” Schroeder said.